“Our new robot is able to travel to the components autonomously and carry out all the requisite tasks there. Measuring, bonding, drilling, milling – it can do it all. 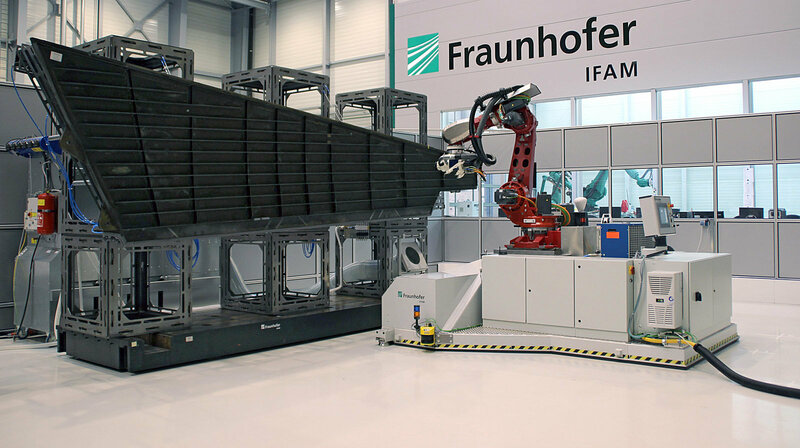 The robot is an all-purpose machine and can be adapted quickly and flexibly to shape inaccuracies of large components as well as product and model modifications,” says Dr. Dirk Niermann, Head of the Automation and Production Technology department at the Fraunhofer Institute for Manufacturing Technology and Advanced Materials IFAM in Stade. Whereas earlier robots have failed when it came to the high precision requirements in the aviation sector, the new robot has no such difficulties: the deviations in its machining results are less than half a millimeter.